This a free mesh avatar that is part of a series on how to make mesh avatars..
Quebot has been hiding from the Adverse Adepts inside the machinery of Phaze. 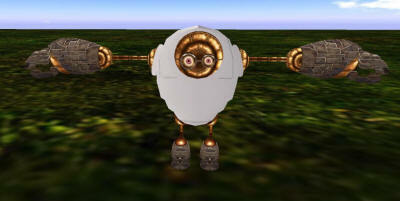 Your job is to rescue him and let him loose from the machinery so he can become a powerful Robot Adept! Que is a simple-to-make flexible all-mesh robot. 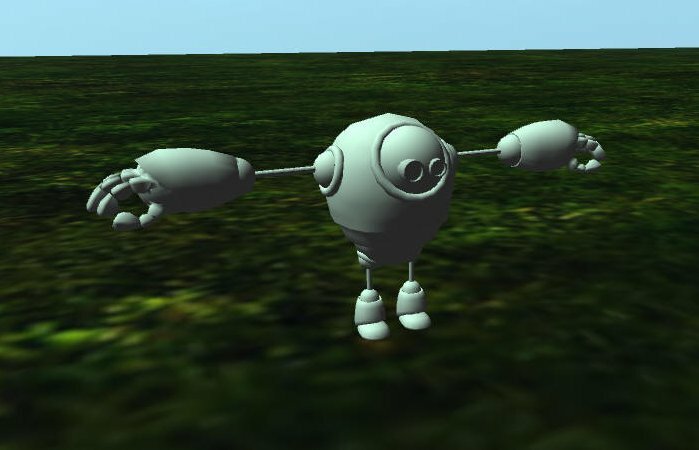 His arms and legs are flexible, and his eyes track your avatar camera movements. He is so simple he just needs to uploaded and textured. 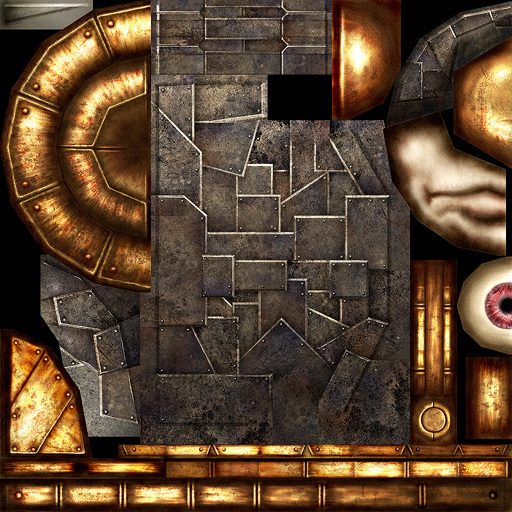 Download the zip file to get all the pieces you need. You will find two textures and a QueBot.DAE file inside the zip. 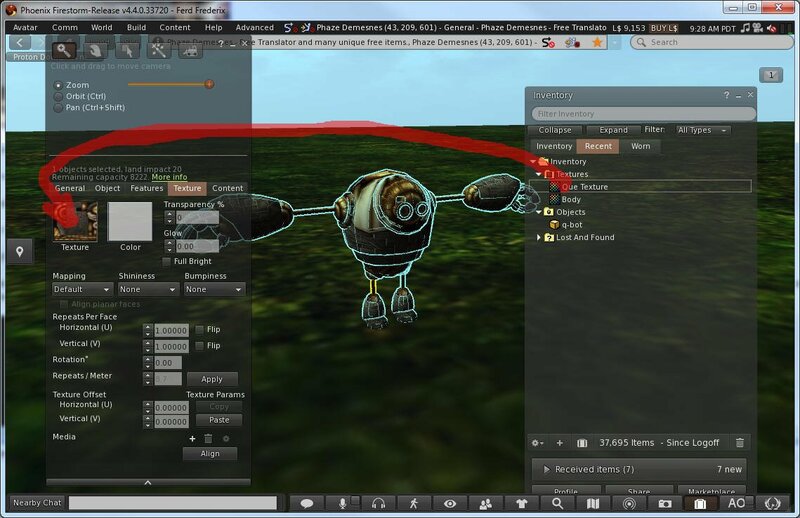 Or you can download them one at a time as you encounter them in this tutorial. 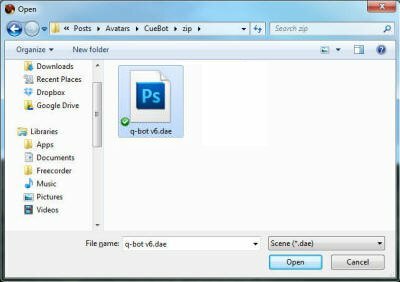 You will need to download this DAE file or locate the Quebot.dae file in the zip file. A DAE file is text with an extension of DAE. 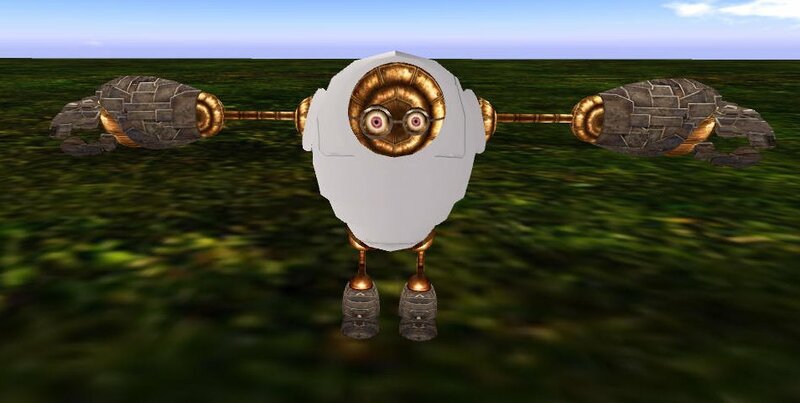 Log into your world and upload the Quebot.dae file. I used the Firestorm viewer for this tutorial. 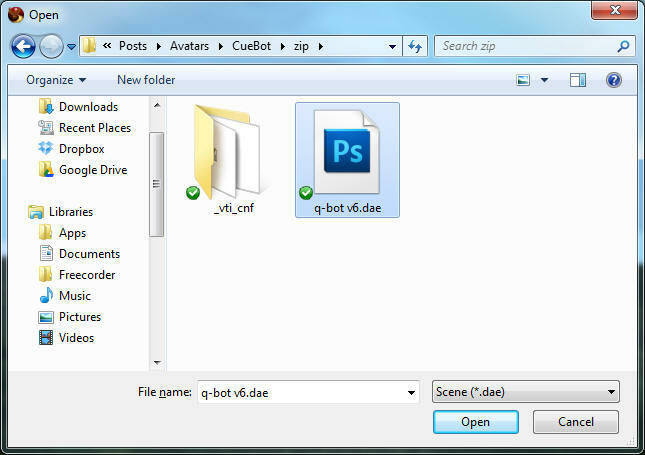 Browse to Quebot using the Upload->Mesh option and select the DAE file. 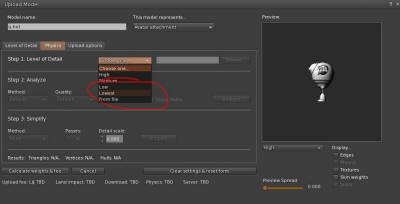 Now pick the Physics Tab and select "Lowest"
Select a size of about "0.2" to "0.5". 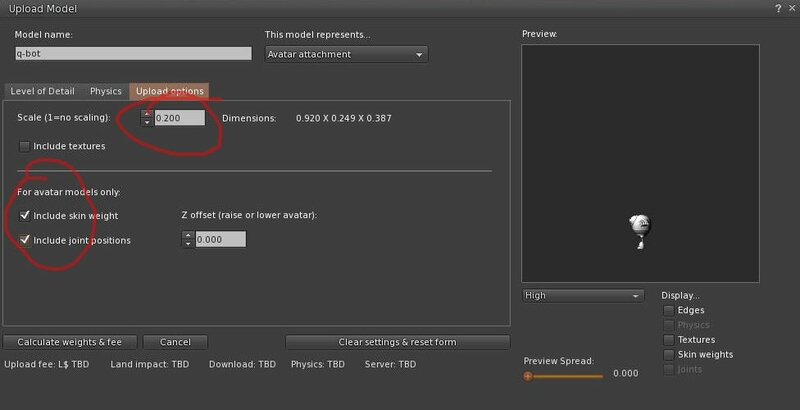 The size of your avatar cannot be changed by this. 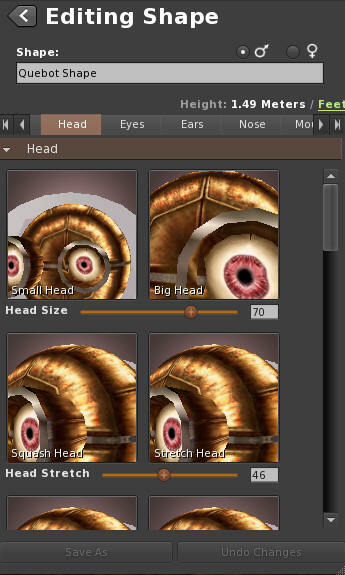 It only sets the size of the prim when you are not wearing it. 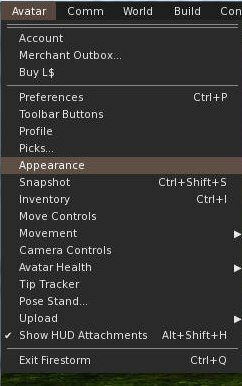 Also check the "Include Skin Weights" and "Include Joint Positions" checkboxes, and enter an offset of 0.00in the Z offset box. 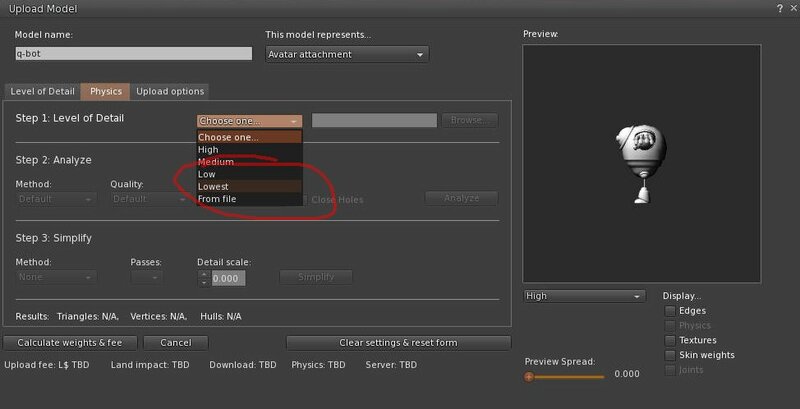 Do not bother with trying to upload the textures at this step. It will not work. Upload both textures to Second Life. 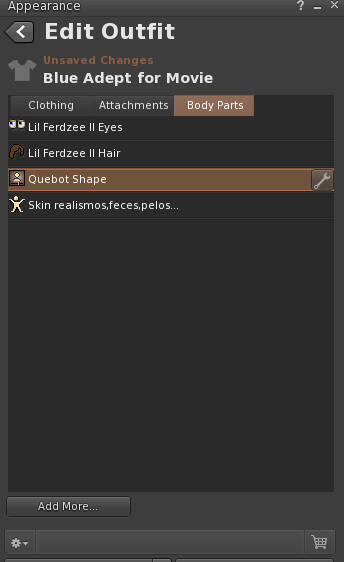 The simplest way to apply this is the edit the Quebot, navigate to the Texture Tab, and drag the "Que Texture" onto the Texture window so that the entire object is textured all at once. 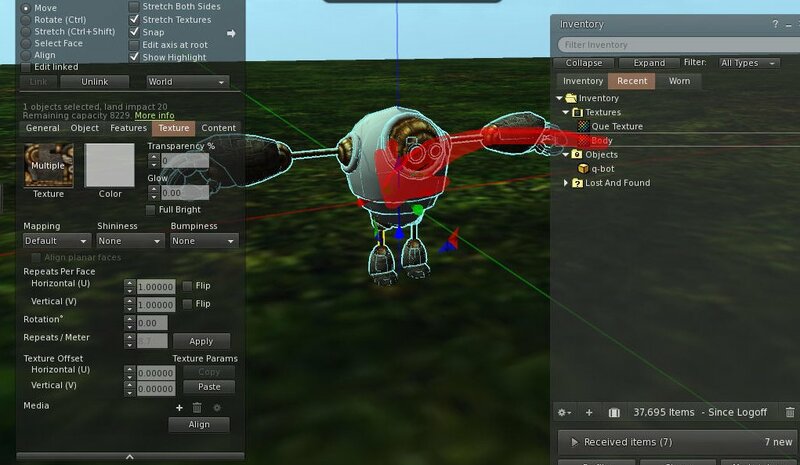 Take Quebot back into your inventory. 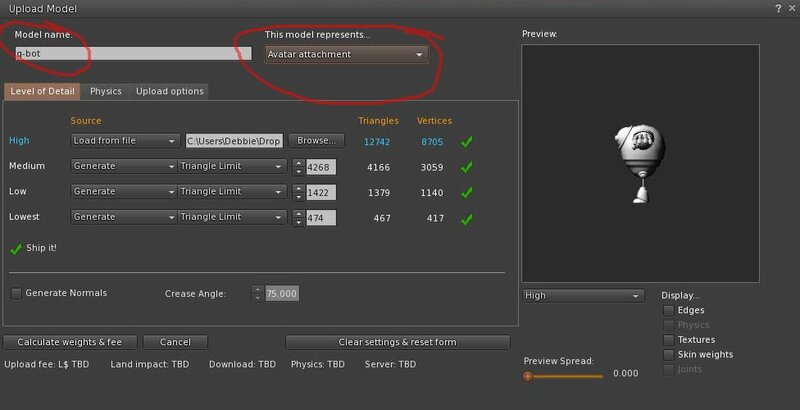 Right click the Quebot in your inventory and select "Attach To". Pick any attachment point that is unlikely to be used, such as stomach. 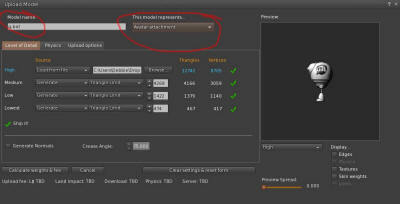 The default is "Right Hand", and that is likely to be used by other attachments, so pick something else. Your avatar will probably look awful! That is because you are wearing all your old prim boots shows, and clothing. First, take off ALL your prim objects. Give it a name and save it. 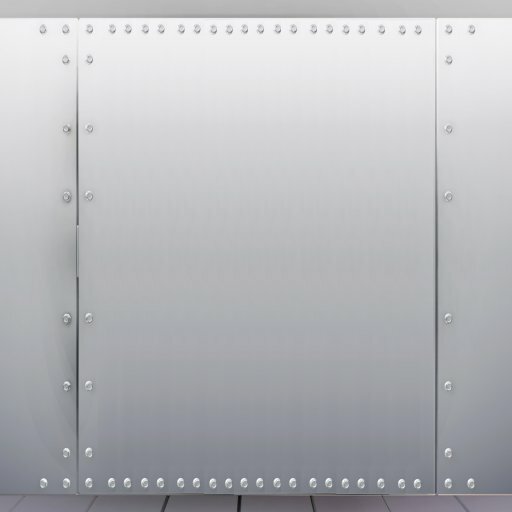 It will likely look distorted due to your avatar shape. You will probably need to wear a modifiable shape and edit the shape. 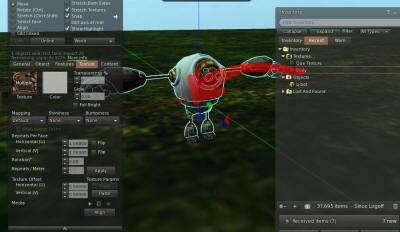 Go into Edit Appearance mode and adjust the sliders to fit the face into the body, and set the leg lengths. 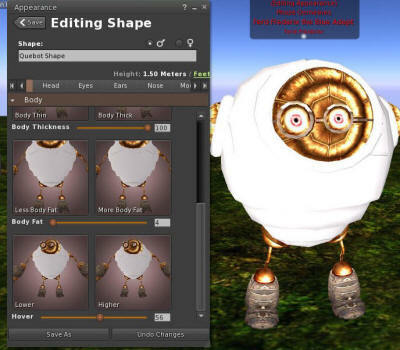 Enjoy your new mesh avatar!